$60 Brent by Christmas is highly probable: Next $85? In April this model predicted the Saudi’s would blink in Doha and Brent would see $60 by Christmas. Well they did blink in Doha; they stopped talking about pumping an extra two-million barrels per day into the pot; incidentally that was just bravado; unless the plan was to stop using oil to make electricity...which would have been unpopular during the summer. Last week in Vienna they threw in the towel. Brent hit $54 yesterday, up $10 from two weeks ago; $6 more in three weeks is looking very possible. Two years ago Rystad Energy were saying breakeven for tight oil (some people call that shale) was $70. That was based on “bottom-up" analysis of financial results of the E&P players; Rystad is a serious outfit, so no reason to disbelieve them. Two years ago the cunning plan (unspoken) was to destroy tight oil. That didn’t happen, it nearly did, but it didn’t, that’s the thing about wars, there are sometimes unknown unknowns. The time-line to watch was Initial Production (IP) and in particular IP per completed well (IP/C). I showed Permian separately from other tight/shale plays because it behaved differently. 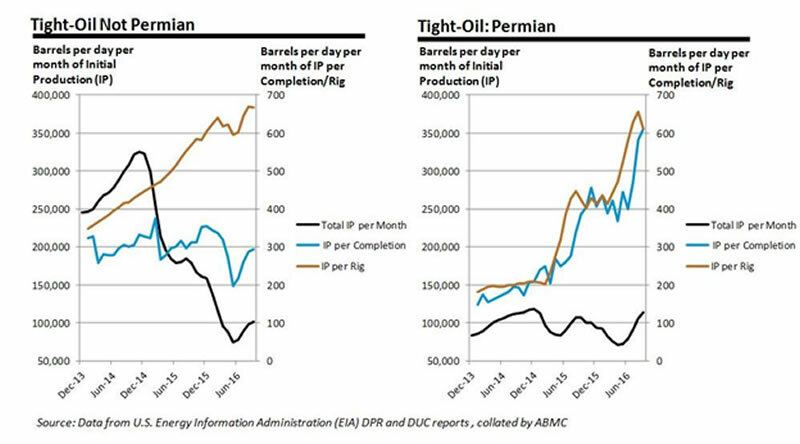 IP/C in Permian is now running at 600 barrels per day (BPD), up from 200 two years ago. Two years ago Permian IP was less than 30% of total tight/shale IP, now it’s 50%; and legacy loss in Permian runs at 4% a month compared to 7% elsewhere. More oil is being brought on line in Permian than was coming on line when oil was $100; likely because (a) the drillers/geologists are getting better and presumably learning from their mistakes (b) the equipment, and the services, are selling for pennies on the dollar. IP elsewhere is ticking up, it’s highly likely the lessons learned in Permian will start to kick in when (not if); Brent goes above $60. After the exuberance caused by the Saudi blink in Doha, or was it a wink? The price went up to $50 (Brent), in May this model predicted $85 by Christmas. Three-weeks to go and that’s looking a bit of a stretch. The above is a matter of opinion provided for general information purposes only and is not intended as investment advice. Information and analysis above are derived from sources and utilising methods believed to be reliable, but we cannot accept responsibility for any losses you may incur as a result of this analysis. Individuals should consult with their personal financial advisors. Andrew Butter started off in construction in UAE and Saudi Arabia; after the invasion of Kuwait opened Dryland Consultants in partnership with an economist doing primary and secondary research and building econometric models, clients included Bechtel, Unilever, BP, Honda, Emirates Airlines, and Dubai Government. Split up with partner in 1995 and re-started the firm as ABMC mainly doing strategy, business plans, and valuations of businesses and commercial real estate, initially as a subcontractor for Cushman & Wakefield and later for Moore Stephens. Set up a capability to manage real estate development in Dubai and Abu Dhabi in 2000, typically advised / directed from bare-land to tendering the main construction contract. Put the unit on ice in 2007 in anticipation of the popping of the Dubai bubble,defensive investment strategies relating to the credit crunch; spent most of 2008 trying to figure out how bubbles work, writing a book called BubbleOmics.